They love to pretend to be soldiers, and march around the house with their pretend guns, and choreograph epic battles. I usually have to walk carefully when I’m carrying a laundry basket, I’ve tripped over many a fallen soldier who was none too appreciative when I accidentally stepped on him. They play super heroes vs bad guys, and I’ve broken up many fights over who has to be on the bad guy team. I’ve broken up many fights period. When one brother does something against the other, and mama sails in to play referee, you can bet the wronged party is going to stand behind me, inserting emphatic “Yeah’s!” as I discipline the guilty one. The trouble comes when instead of letting me deal with the situation, they decide they are going to exact some vigil ante justice, and let their brother know what’s up. To counter act this, I have gotten into the habit of holding my warrior back, and saying a key phrase: “Let me fight this battle for you. I will fight for you.” I think the first time I said it, it was something of a letdown for them as I didn’t actually start ninja fighting. Over the course of the last few months I’ve heard myself say that exact phrase over, and over…and over…and over again. These little people are passionate about what they perceive as right and wrong, and they aren’t afraid to let their siblings know about it. A few weeks ago, I asked Ryan to call his brothers to dinner. They were bent over Steven’s tablet, engrossed in whatever game he was playing. I watched Ryan go over and politely inform them dinner was ready. He waited. No response. He repeated himself a little louder this time. They both mumbled a monotone “ok,” without looking up. He began to get agitated, and he huffed as he looked over at me. 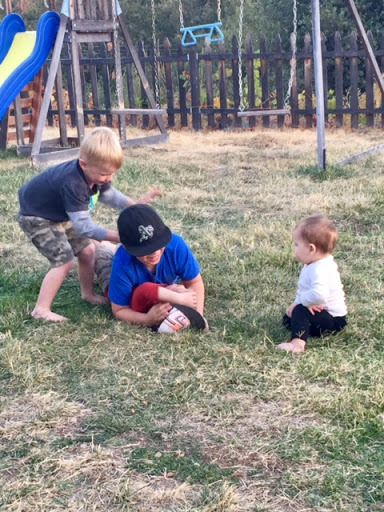 “It’s ok Ryry,” I said, “I’ll take care of it.” He looked at me with his blue eyes that always make me melt (never ever look directly into them if you plan on saying no to this kid), and said calmly and clearly, “Mom, let me fight this battle for you. I will fight for you.” He marched over closer to his brothers and let them have it. I was too stunned to do more than watch as he herded his usually over powering brothers to the table and got them to sit down. For days afterwards, and still even now, that scene keeps replaying in my mind. Something connected in my heart when those simple words came out of my sweet baby’s mouth. I rewind it again, but instead of a sweet little boy, I see my Savior looking at me saying, “Let me fight for you.” In the day to day struggles of mommydom, and adulthood, the inclination to take on my own challenges, in my own power, and out of my own agenda, is a strong one. “The Lord will fight for you; you need only to be still.” Exodus 14:14. Be still. Sure. I don’t know about you, but as a mother to four kids I am not often still. Lately I have felt so weighed down by the things I try to carry by myself: parenting, financial stresses, wanting to keep my marriage thriving, worrying about family, friendship struggles, health worries, guilt over not being in better shape and the needs of the ministries I serve in. They are all pressing in, and I can feel myself caving under the pressure. Being still sounds like a delightful, yet unattainable fantasy! A memory of my husband singing “Let it go! Let it go!” to me comes to mind, and I can’t help but laugh. It really is that simple though. Let it go! These things that are causing me so much angst and unnecessary stress are not mine to carry. No, I don’t get to hide in an impressive ice castle and just stop dealing with life, but the level of importance I put on doing it all myself can certainly stand to be taken down a couple notches. “Be still and know that I am God.” Psalm 46:10. He’s got this. Can I get an amen to that?? Too much of my time lately has been spent feeling distracted by the next thing that needs my attention, worrying about what I’m not doing that I should be doing. It’s madness. So, today I am going to focus on being still. I am not going to feel guilty for skipping my morning exercise routine. I am going to be still. I am not going to stress about upcoming needs for MOPS. I am going to be still. In the midst of the chaos of dealing with the kids, I’m going to….well, I’m not exactly sure how to be still while doing that yet. That’s the beauty of always being a work in progress, you always have something to learn. But I am at least going to try to let my mind be still and not try to think of all the ways I am potentially screwing up my children! Baby steps people. He is God, he knows our struggles, he’s willing to fight for us, and I’m pretty sure he has some awesome ninja fighting skills. Just let it go.